The company have forged agreement with Ninoy Aquino Parks & Wildlife Center for the rehabilitation of the shelter and habitat of its Philippine Eagle. Greenery and landscaping will likewise be updated. A Scholarship program leading to livelihood is in the planning stage. Selected Scholars will be trained in Technical skills which would enable gainful employment opportunities after training. The company is in discussion with the TESDA to select the appropriate technical courses. UAP Manila Maharlika is an organization of practicing architects who has served the construction industry for 33 years now. 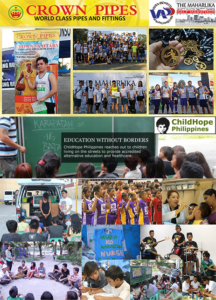 This event will raise funds for the benefit of ‘The ChildHope Asia Philippines’. Read More..